The custom built, performance optimized 15.6” EUROCOM X3 is powered by NVIDIA GeForce GTX 880M graphics and 4th Generation Intel Core i7 Extreme Processors. The custom built X3 allows customers to build the exact system they desire. 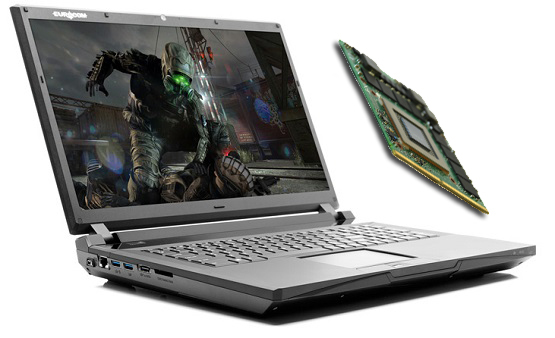 Performance is unmatched with 4th Generation Intel Core i7 Extreme processors, NVIDIA GeForce GTX 880M graphics. Having the ability to add up to 32 GB memory ensures nothing will slow these gaming beasts down. To store the latest games and software the X3 supports up to 5 storage drives, with 2 mSATA solid state drives waiting for fast boot up times and blazing responsiveness. Enjoying the latest game is all about visuals and sound. The X3 supports beautiful full high definition 1080p 1920x1080 displays. High definition audio, ONKYO sound and Sounds Blaster X-Fi enable users to hear the enemy creeping up behind them. The NVIDIA GeForce GTX 880M graphics card has 1536 CUDA cores running at 954 MHz + boost with 8 GB GDDR5 memory running at 2500 MHz. The NVIDIA GeForce is faster and more power efficient than the previous generation and offers a multitude of cool new features. The 880M features blazing performance, battery saving technologies such as new NVIDIA Battery Boost, and the addition of cool new gaming features such as ShadowPlay and GameStream. The 880M is equipped with GPU Boost 2.0 for overclocking to allow for maximum performance. Personalize your own X3 weapon with a custom backlit keyboard, with 7 colours, 3 zones and 8 modes you have the ability to dominate and stand out. A sleek, customizable light illuminates the keyboard, hinting at the power held within the aggressively designed chassis.